Organic food, organic makeup, and now organic baby clothes? It seems like the word organic has been applied to almost everything lately, in what some may see as a feeble attempt to get you to spend more on the products you use every day. Few of us will deny that natural can be better in certain instances, but how can you judge when organic actually matters? How can you better decide when going for the organic option will actually make a difference in the health of your family? Well for starters, we need to take a look at how our children are affected by chemicals commonly found in kid’s products. What Are My Kid’s Clothes Made Of? It might surprise you to learn that many companies you know and trust have recently been linked to toxic children’s clothing and products. You wouldn’t expect big brands to necessarily be selling all organic baby clothes, but for them to be selling toxic baby clothes is a real shock to many parents. In fact, many major retailers including Wal-Mart, Gap, Gymboree, Hallmark, and H&M have reported using toxic chemicals in their products. Unfortunately, regulations and requirements regarding the toxicity levels of children’s products have only recently been gaining traction. Brands are still not required to fully disclose their product ingredients, and obtaining real information about what’s inside your kid’s clothing is not easily done. With so much grey area surrounding this topic, a growing number of concerned parents are taking the matter into their own hands and seeking out organic options. 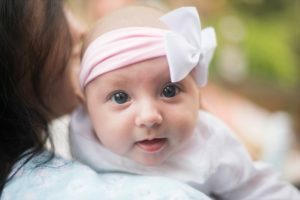 In response to the growing concern over children’s health and their exposure to chemicals, more and more parents are turning exclusively to organic baby clothes and other kids’ products. Luckily, many companies have answered the cry for help and have started creating a host of exciting, stylish, and innovative organic products for children. It is now easier than ever to find safe, non-toxic clothing for your growing little ones. Even some of the companies that were once big contributors of toxic products have begun to add non-toxic lines to their empires, such as the organic baby collection at Gap. While the word organic has been rather loosely thrown around lately, the concept of keeping your children away from toxic chemicals is an important one. Kid’s immune systems are particularly susceptible to the negative affects of chemicals, and buying organic baby clothes, food, and other products is an easy step you can take to ensure your children are protected. Make sure you look at the ingredients in products you use at home, and consider their affect on the health of your loved ones. You can also take it upon yourself to reach out to your favorite brands and state politicians to tell them that organic and safe baby products are important to you. With every letter they receive, company and government policies are more likely to make the major changes needed to ensure all children’s products are non-toxic and chemical free. To find out more about Kangovou, and our line of BPA and Toxin free children’s diswhare, please click here.